In many towns across America, Walmart, or a similar mega-retailer, is the only option you have when you need (almost) anything. Big-retail is a monopoly in its truest form and it has become so, not through “free market” economics, technological innovation, supply and demand, or healthy competition, but rather through a combination of pro-monopoly rules and regulations, human exploitation, outsourcing labor overseas, while preventing labor domestically from unionizing for better wages, job security, and benefits. The consumers pushing their carts through the aisles of Walmart scarcely realize the conditions within which workers overseas toil to line those aisles. They may not realize that the polo shirts they are buying came from overcrowded, deplorable factories in Bangladesh, where a fire recently claimed the lives of 112 workers. The doors were locked, the fire extinguishers non-functional – conditions that would not be tolerated in an American factory. These aren’t “always low prices” because Walmart has mastered supply and demand or production efficiency through innovation – these are “always low prices” because people the average Walmart customer has no idea even exist, are paying the rest of the price out of sight, out of mind. Along every step of the Walmart’s supply chain, abuses, exploitation, deceit, and harm is being done to both labor and consumers. The only benefactors are the handful of shareholders and executives that run Walmart – who live a life entirely isolated from the paradigm their spanning monopoly has created. 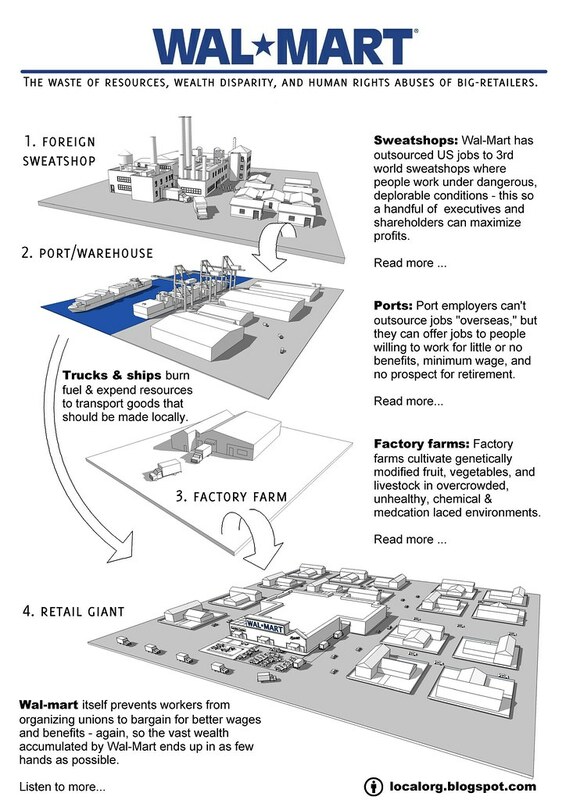 Below, an infographic depicts this supply chain – starting at overseas sweatshops, brought through domestic ports where workers struggle for job security, fair wages, and benefits, and end up on the shelves of Walmart, where likewise, labor must struggle to improve their lot. Image: Hover mouse over image to find links to relevant stories. Right-click and “open in new tab” to stay on this page. Additionally, many of the foods lining Walmart’s shelves are genetically modified, many come from factory farms where crops and animals are overcrowded, laden with chemicals and medications, and end up as literally poison on your dinner table. The grocery aisles of Walmart are where big-agri converges with big-retail – again to the detriment of both labor and consumers. It must also be remembered, that all of this exploitation and deceit takes place within a vast global supply chain that uses freighters, trains, planes, trucks, and automobiles to connect consumers with goods produced around the world – using huge quantities of energy to move goods, keep some within strict temperature requirements, and keep lights burning 24 hours a day, 7 days a week to allow consumers to come in and peruse the selection. Perishable goods that pass expiration are simply thrown out – packaging used to transport these goods around the world are likewise disposed of as waste. If not anything else, it is inefficient and wasteful. Activism isn’t Enough: It is important to educate people as to the real cost of their “always low prices.” However, educating people alone is not a viable solution. The media industry is also an abusive, exploitative monopoly. The ills of this industry had their critics who ceaselessly promoted boycotts, but ultimately to no avail. It wasn’t until a technologically derived alternative, peer-to-peer (P2P) file sharing, came along that people in large numbers began to undermine the media industry – to the tune of billions. 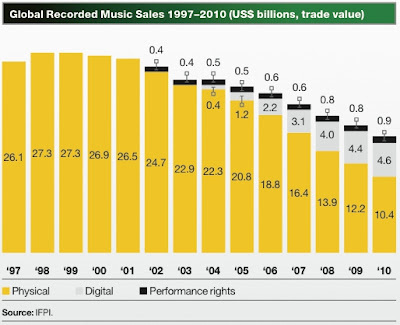 People with no political opinion or awareness at all regarding the music industry, for example, simply wanted their music for cheaper (or free). Little argument was necessary to convince people of the merits of sharing digitally. The media industry lashed out (and still is), with draconian exercises of its incestuous relationship with government – the supposed representatives of the people – with rules and regulations to reassert their monopolizing paradigm. However, like the British Empire losing its gripe on the increasingly self-sufficient, independent American colonies, the media industry is losing to this revolution. The lashing out turned many otherwise apathetic people, simply enjoying cheaper/free media in the emerging digital paradigm, into activists, and better yet, producers of content, and patrons of open-content to completely escape the media industry’s reach. The result is an alternative, parallel digital media paradigm that is increasingly taking a larger piece of the market, while media monopolies shrink. The wealth to be made in media is being distributed over a larger community of producers and artists – not through wages or populist handouts, but through entrepreneurship and collaboration. Similarly, we must look for such a solution versus all industry monopolies – including big-retail, where nearly all of these monopolies seem to converge. Imagine, a city block, or several blocks, all within walking distance, where you could obtain everything you needed, produced and made available locally. Imagine if everything was made either on demand, or made with an intimate understanding of the local community’s needs in small runs. Imagine if the quality was better, the price cheaper, the experience more satisfying, and with nearly everyone in the community being self-employed. This is a paradigm that is emerging – with options and lifestyles that will be so appealing, apolitical people simply seeking the path of least resistance will not need to be convinced to join in – just like with P2P, the benefits will be self-evident. The answer to Walmart, a place where you can buy (almost) anything – is a place where you can make (almost) anything. Such a place was imagined by MIT Professor Neil Gershenfeld. Called a FabLab (Fabrication Laboratory), it serves as the setting for a course literally titled, MAS 863 How To Make (almost) Anything. 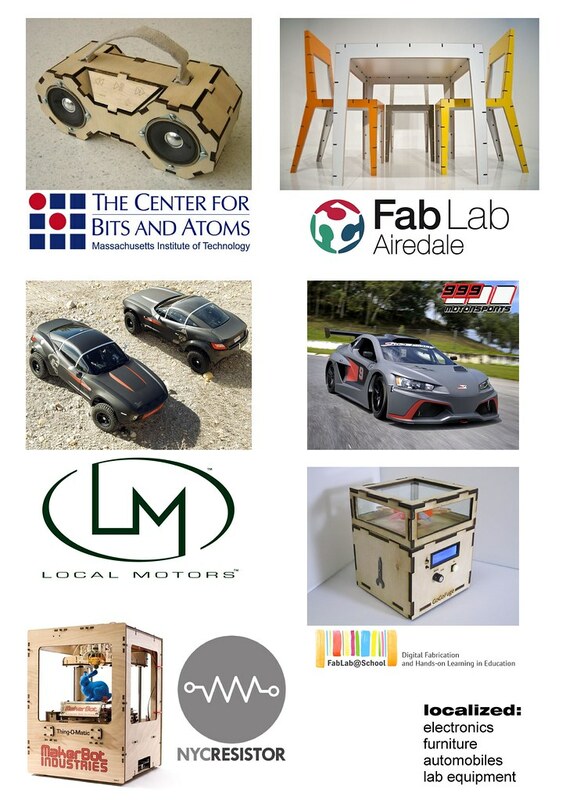 In it is a collection of modern manufacturing machines – from computer controlled mills and laser cutters, to 3D scanners, electronics production equipment, and 3D printers – where students are taught interdisciplinary skills ranging from engineering and programming, to designing and art. 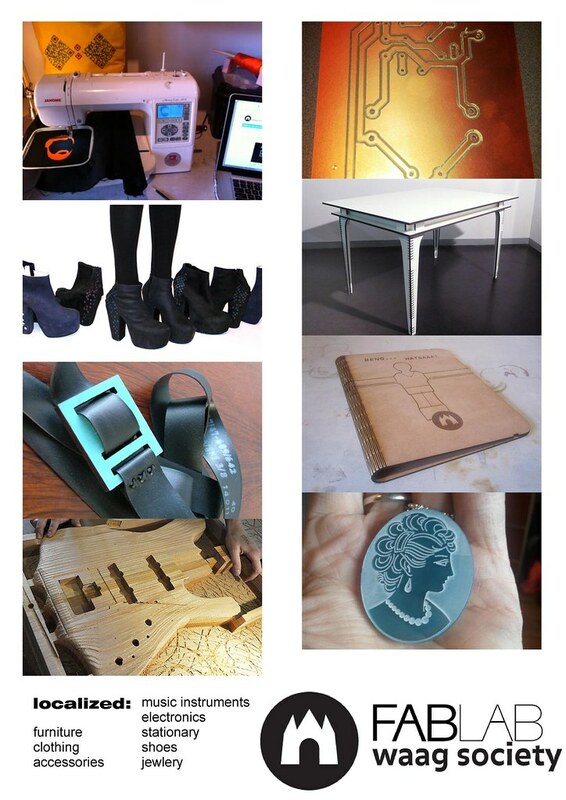 The machines found in the MIT FabLab are expensive, but many are not beyond the reach of aspiring, local entrepreneurs. Increasingly, many of these machines are becoming small enough and affordable enough to fit on the average person’s desktop. Locally organized spaces where a similar collection of tools and interests converge to accomplish many of the same goals as MIT’s FabLab are called “hackerspaces” or “makerspaces.” These are not standardized, and each one is as unique as the community within which they spring up. Experimenting, education, research, and development take place at hackerspaces, and occasionally an entire business model may result. Community projects have also been undertaken by these emerging local institutions. The “maker” mentality has also translated into the world of heavier industry – including car manufacturing. Crowd-sourced car manufacturing serves as the basis of America’s Local Motors, while local race car design, development, and manufacturing constitutes Thailand’s 999 Motorsport’s business model. The world of biology is also being transformed by this emerging paradigm – with local community “DIYbio” labs giving people a safe and secure place to study and develop local biotechnology. Agriculture as well is being “re-localized” by community gardens around the world, both by necessity and as a political statement. 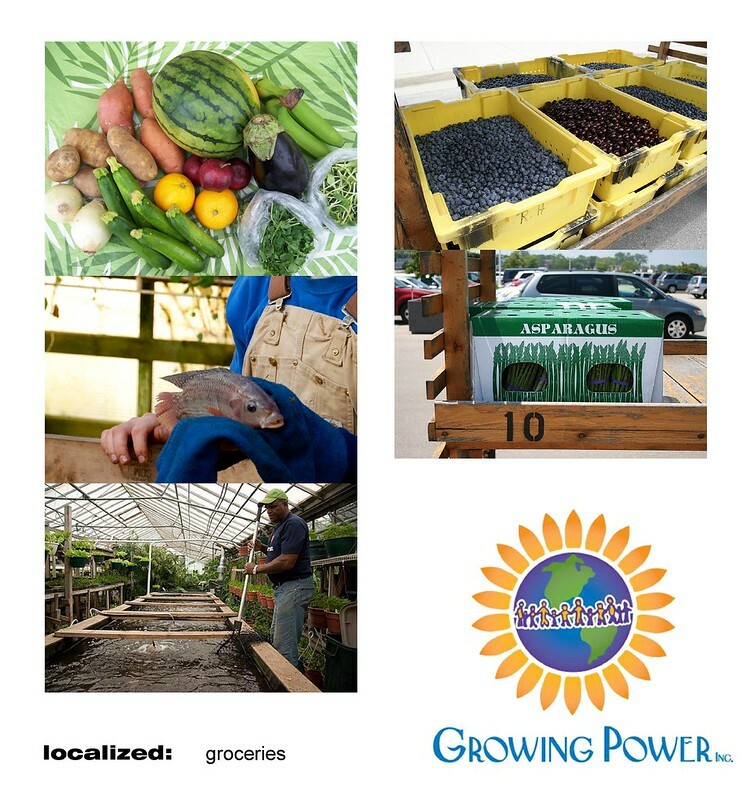 Growing Power operates an urban agricultural operation, producing crops and fish, while helping others replicate their business model around the world. Other city dwellers are taking advantage of under utilized rooftops, planting gardens to produce fresh, organic vegetables. An emerging trend is for restaurants to grow at least some of their ingredients on their rooftops in a phenomenon known as “roof to table dining.” Food waste doesn’t go into the trash, but rather into the compost bin to be reused in the growing process. 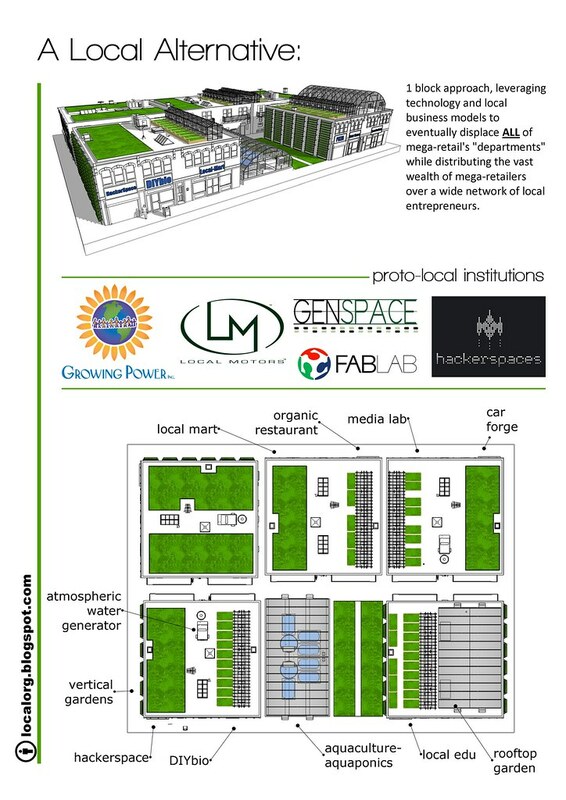 Now imagine all of these ideas, along with localized education, communication infrastructure, farmers’ markets (and maybe maker’s markets or a combination of the two), locally sourced water (atmospheric water generators) and many other ideas all combined within the confines of a single block or village. You now have a living breathing, self-contained, semi-insulated localized version of everything Walmart offers, minus the sweatshops, cheap labor, wasteful global logistics networks, and all the instability that comes with a globally interdependent socioeconomic paradigm. Localizing, decentralizing, and undermining these monopolies is the real revolution of our time. The “Arab Spring” was manufactured to fulfill a human need to affect change in the face of adversity. The monopolies are trying to channel the backlash to increasing global disparity, by redirecting it into a geopolitical struggle, one that in fact only widens the very disparity people are increasingly becoming angry over. Obviously big-retail is not going to simply allow people to decentralize and replace their vast monopoly. Big-business of all sorts have assembled a multi-pronged attack including passing legislation aimed at regulating out of business small start-ups with impossible-to-meet requirements they themselves have no intention of meeting. They are also attempting to simply make “illegal” any practice that threatens their antiquated business models, e.g. SOPA, ACTA, and the war on file sharing. They have also attempted to co-opt, buy-off, and partner with these emerging “proto-local institutions.” And for now, it may buy them time. 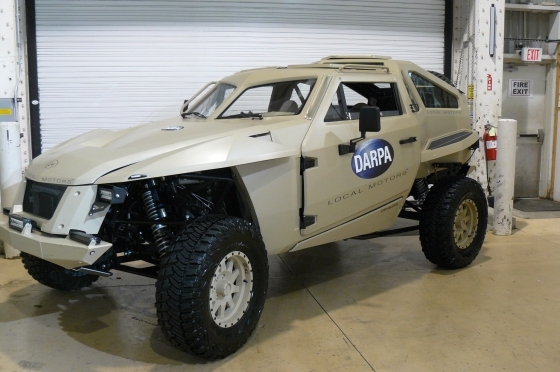 In the long run, Local Motors partnering with DARPA and other large corporations for competitions, or Growing Power accepting a $1 million dollar grant from Walmart, or any number of the many hackerspaces emerging around the world being co-opted or shut down by the system, will not stop localization. The reason these emerging institutions became known and wildly popular in the first place, is because they satisfy a desire people have. They present a viable model of future socioeconomics – one where the pie gets bigger, and so does our access to it. If these emerging institutions falter, others will take their place. Likewise, we will see many of localization’s pioneers grow and then collapse into their own footprints – but not for long. As more people begin on this journey, and as disparity diminishes, the ability to become big enough to reach “corporate-critical mass” will likewise diminish. 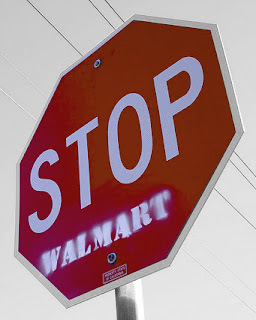 Walmart can shower a million dollars onto Growing Power, but not on operations like it emerging in every county of the United States. This is not going to happen overnight. Just like P2P file sharing, the corporations will hemorrhage billions, and overtime diminish. The transition should be orderly, gradual, and allow the talent that inhabits the rank and file of the largest corporations on Earth the ability to “switch sides” and establish their own practices, firms, design houses, fabrication shops, and other enterprises locally. We will continue to build up our capacity, while we continue chipping away at big-business and its capacity. Eventually there will be a tipping point, one the monopolies will fight tooth and nail, with overt confrontation and subtle subversion to prevent from going over the edge of.